A wire request form is a document which is prepared by banks and financial institutions who offer wire transactions to their clients and account holders. Wiring money allows anyone to transfer funds electronically which means that the transfer will be easier and faster as opposed to sending physical money to a recipient. Nevertheless, the parties involved in the transfer should only execute the transaction with a trusted wire service provider to ensure that the funds will be sent successfully without delays. Account holder’s information: This serves as the personal information section of the account holder or the requesting party. In this section, the account holder’s name along with his account number, social security number, date of birth, phone number, and all other pieces of information which can verify his identity will be required to be disclosed. Transaction type: The purpose of conducting the wire transaction will be defined in this section of the form. It must also state what type of procedure is requiring the account holder to submit the wire request form such as investment or fund distributions to other parties of an organization. Wire instructions: This is where the details of the wire recipient will be indicated by the account holder. The information to be collected in this section would be the recipient’s bank name, bank address, and bank phone number, as well as the recipient’s account name, account number, and wire routing number. In addition, the type of account that the recipient has, whether it is a personal account, a joint account, a credit card account, or a debit card account, should also be defined in this section of the form. Authorization: This section is allotted for the signature of the requesting party or the account holder along with the date when the form was used by him. Upon affixing his signature in the form, the account holder is permitting the bank or financial institution to execute the wire transaction and to use the data that he disclosed to conduct the transfer. 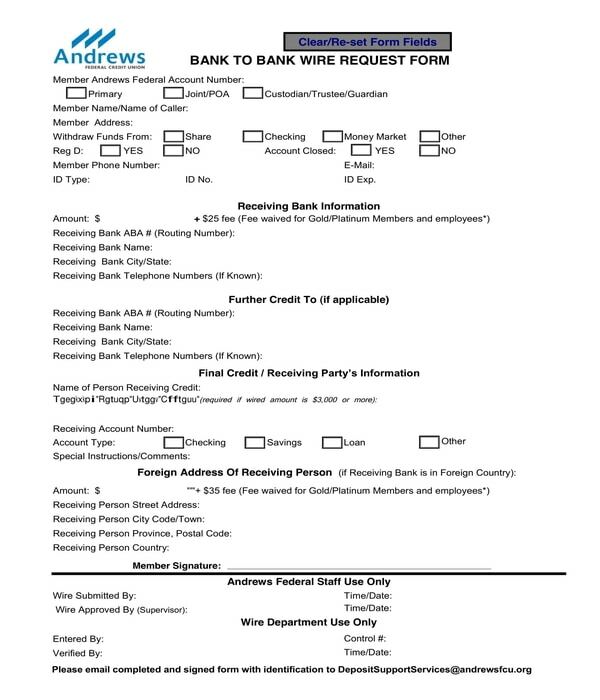 Bank to Bank Wire Request Form – Federal credit unions are non-profit financial institutions that work similarly to a for-profit bank. Credit union account holders or members can also transact using wire transfers and electronic banking. Specifically, if the intent of a union member or account holder is to transfer funds and credit amounts from one bank to another, then he will have to use a bank to bank wire request form. 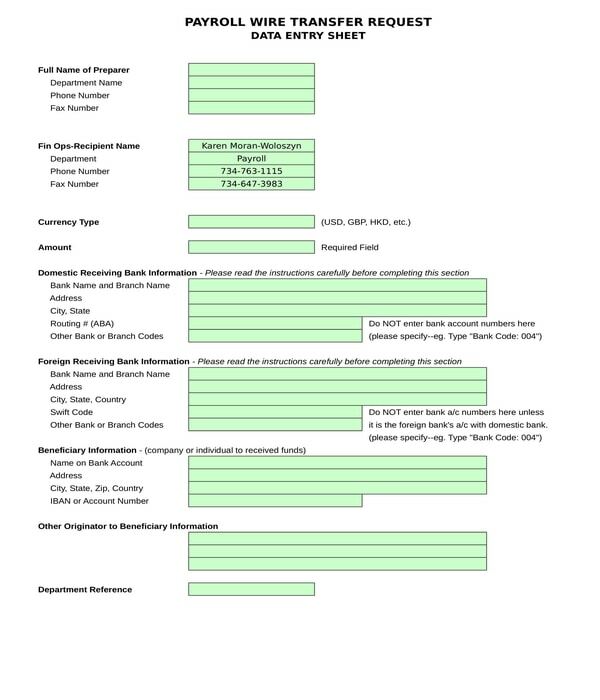 This form will collect the basic data of the union member along with the information of the receiving bank and the receiving party, and the foreign address of the receiving party if the bank is outside the State or country. 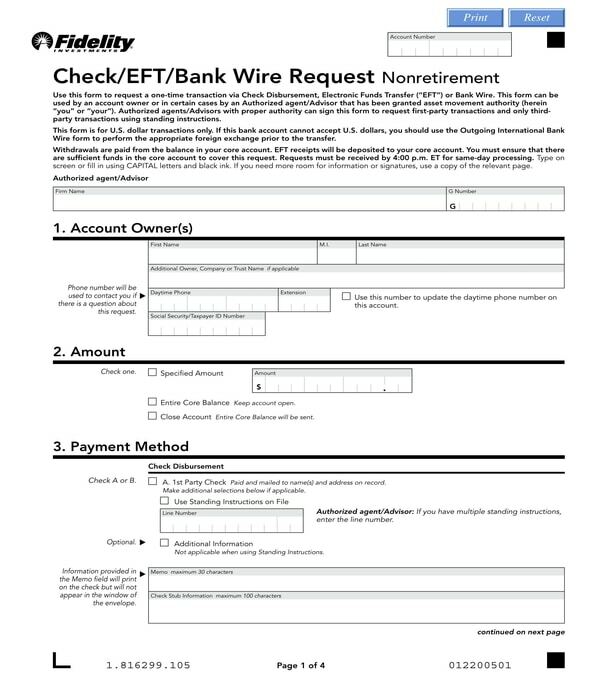 Bank Wire Request Non-Retirement Form – There are wire request forms which allow the bank to wire funds automatically on specific dates of months as defined by the account holder in the form. On the other hand, there are also forms which are intended only for one-time transactions such as a bank wire request non-retirement form. There are four sections in this form which must be filled out by the account holder. The account owner’s personal information, the amount to be wired, the payment method, and the authorization of the account holder to begin the wire procedure are the information to be disclosed in the different sections of a bank wire request non-retirement form. 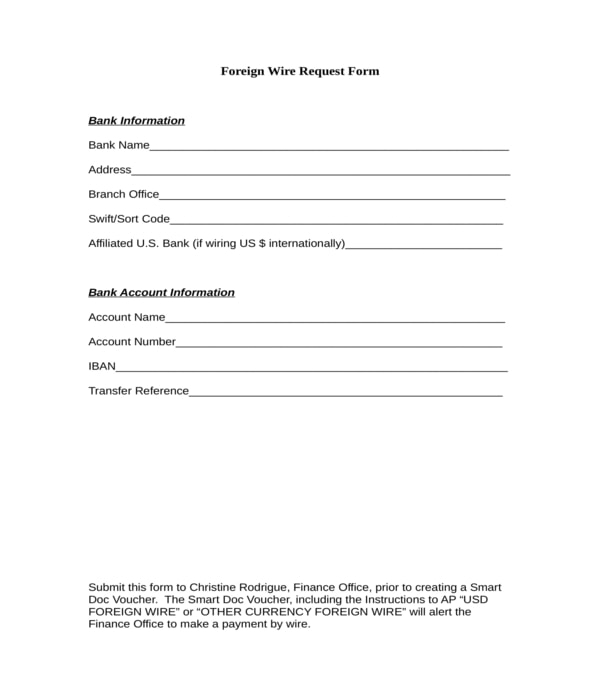 Foreign Wire Request Form – This is the variety of wire request form which is to be filled out by an account holder who will be wiring funds to a foreign bank or State account. In a foreign wire request form, two sections will have to be completed by the requesting party. The first section is for the bank information of the recipient which will gather the name of the bank, its address, bank office, sort code, and its affiliated State bank. The second section of the form, on the other hand, is intended for the recipient’s bank account information wherein the recipient’s account name, number, IBAN, and transfer reference will be the data to be disclosed. When using wire request forms, the account holder or the requesting party must ensure that he is inputting the right data in the form since every piece of information will be used for the transaction. For this, a rechecking and reviewing process must be executed by the account holder as well as the recipient who will be receiving the wired funds. Another tip in using wire request forms is to make sure to know what data is being required in each section, and what accompanying documents must be submitted to support the information disclosed in the request form. For instance, an account authorization letter or a bank authorization should be provided by an authorized agent of an account holder if the one who is requesting the wire transaction is not the account holder rather his legal representative. After a wire request form is completed, the requesting party must submit the form to the authorized personnel of the bank or the financial institution where the wiring process will be conducted. Once the funds are wired successfully, the account holder must ask for a receipt of the transaction. 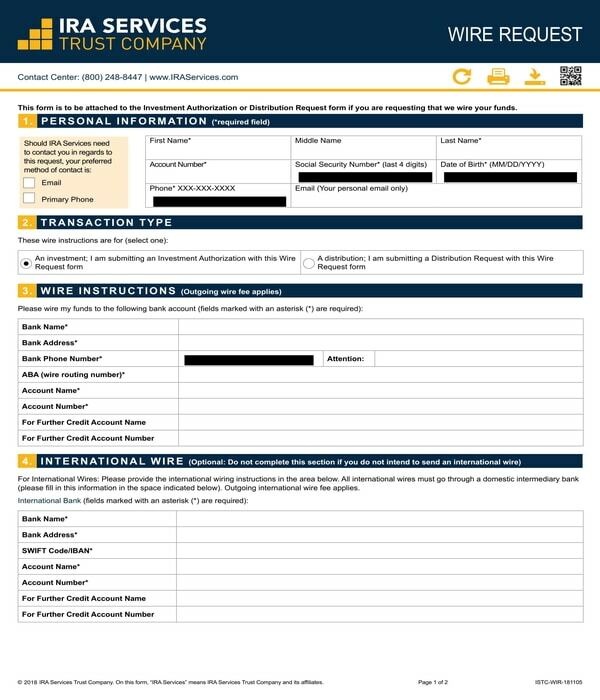 The wire request receipt form will serve as a documented proof that the transaction occurred within the specific time, day, and by the personnel and the account holder. This mandates accountability for all the involved parties of the wire transaction.